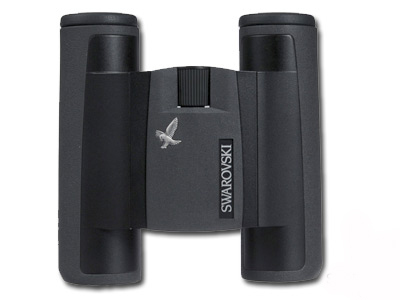 The 10x25 CL Pocket Binocular from Swarovski is a lightweight and convenient close to mid-range optic that combines the build quality and image quality that nature enthusiasts have come to expect from Swarovski. This addition to their lineup of compact binoculars features a unique dual-hinge bridge that is scalloped on the underside to allow the barrels to fold underneath the concave bridge for a reduced footprint; when folded, the 10x25 measures only 4.3x2.5x1.8"—compact enough for a cargo pocket or side pocket of a daypack. The folding bridge design also gives the CL Pocket binocular its broad, 48-74mm interpupillary range that can be adjusted to fit children and adults alike. In addition to the noteworthy compactness of the CL Pocket series binoculars, these glasses are packed with Swarovski's usual gamut of premium optical features; including fully multicoated glass, comfortable 17mm eye relief, 52° apparent viewing angle, and a minimum focus distance of 8.2 ft. Swarovski also packages their CL Pocket series with a Field Bag carrying case that has a zippered closure, separate accessory pocket, belt loop, and ripstop nylon interior lining. A water-sealed aluminum housing equips the CL Pocket binocular for reliable, shock-resistant performance in extreme temperatures and driving rain. Additional user-friendly features include twist-up eyecups made of hypoallergenic material and a textured centre focus wheel that is slightly recessed into the bridge for a more streamlined silhouette. The 10x25 CL Pocket fuses portability and performance, making it a go-anywhere compact binocular that is big on image quality. Interpupillary Adjustment	48 - 74 mm / 1.9 - 2.9"